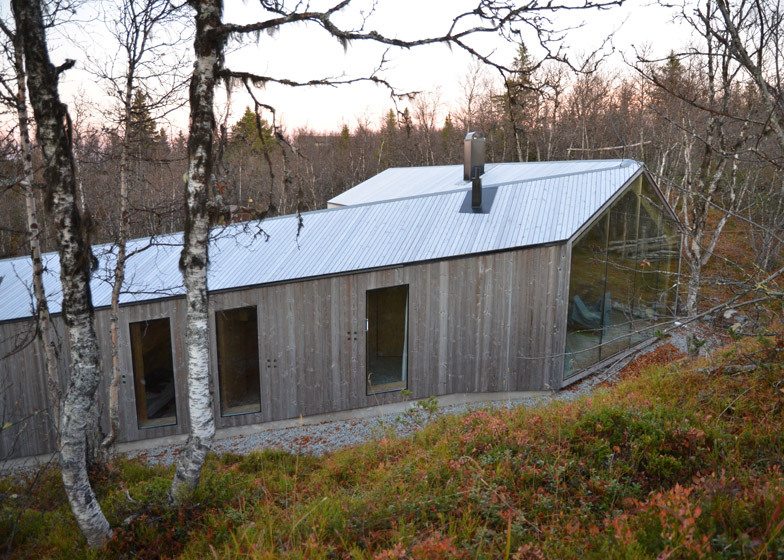 This pine-clad cabin by Reiulf Ramstad Architects has two glazed gables that frame views of the Norwegian landscape and a V-shaped plan that follows the slope of the mountainous terrain (+ slideshow). 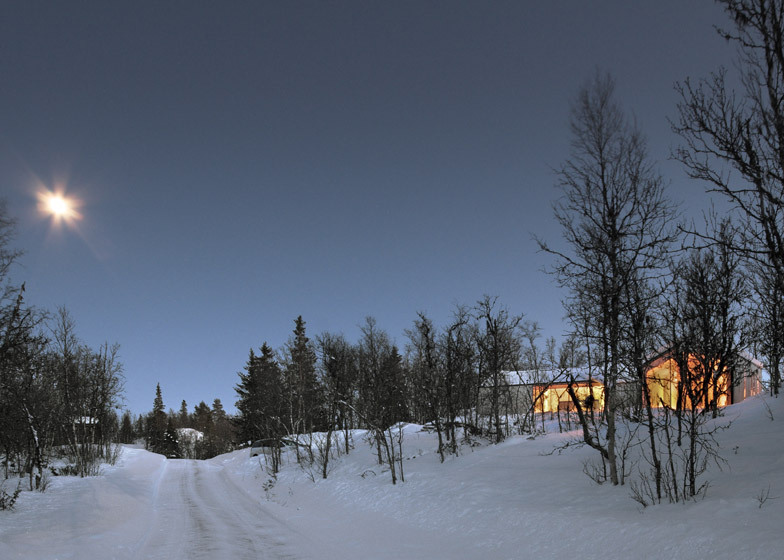 Surrounded by cross-country ski tracks and hiking tracks, the 120-square-metre building is situated in the mountains above a village named Ål in Buskerud county, and is home to a family of five. 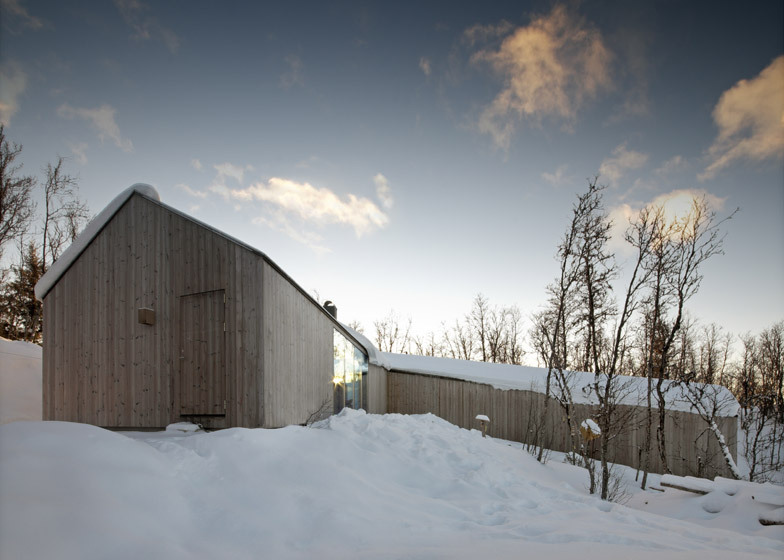 Oslo-based Reiulf Ramstad Architects named the building V Lodge, in reference to its two-wing layout that separates social areas from bedrooms. 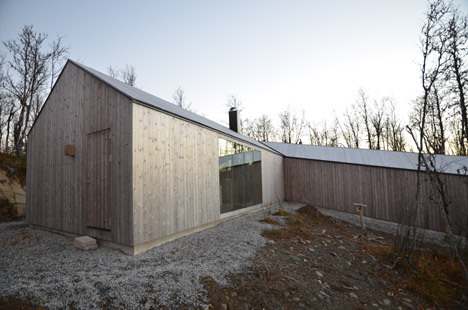 The plan was organised to suit the natural topography of the site. 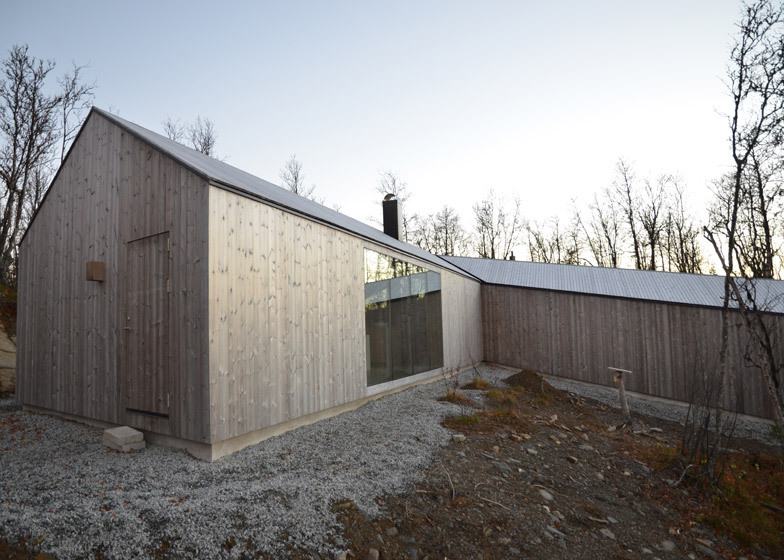 The wing housing a combined living and dining area sits on the crest of the hill, while the bedrooms and a playroom occupy a sloping volume that projects its glazed gable down the hillside. 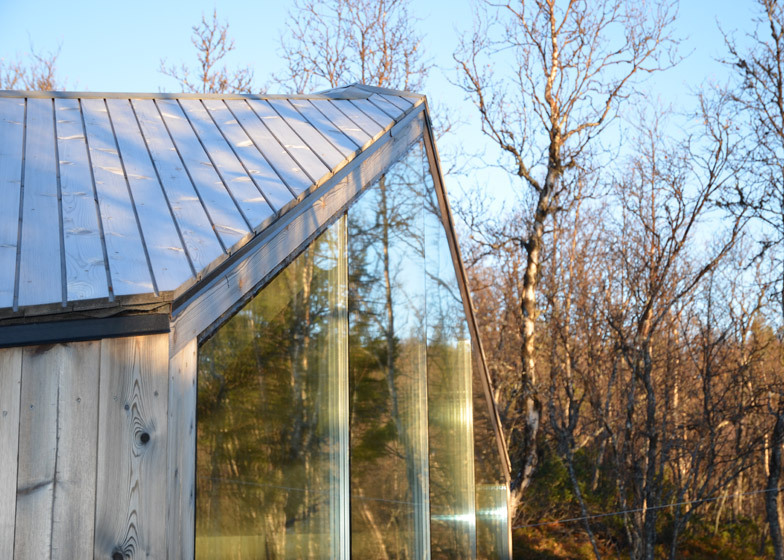 "The cabin is gently placed on the slight slope of the site, where the volume creates small microclimate zones with beneficial sun conditions for outdoor activities and easy access from the interior," explained the architects, whose past projects include a wooden chapel with a grand spire and a jagged glass cafe. 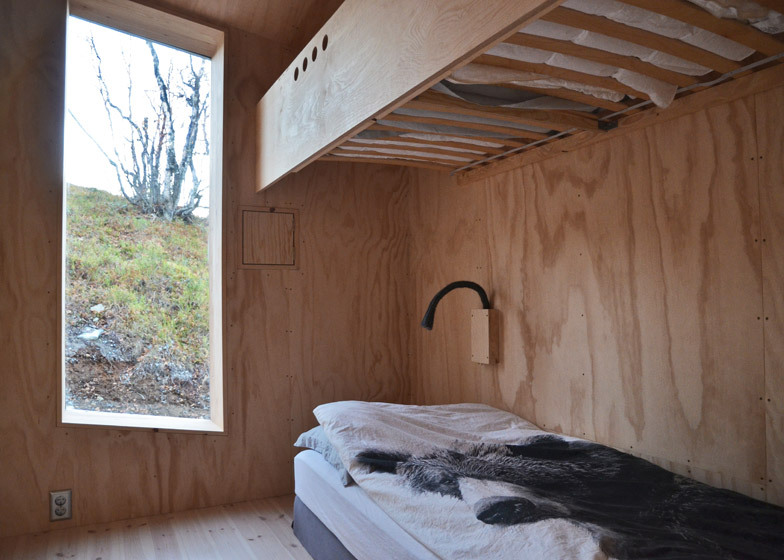 "Its form reinterprets local and national building traditions, with materials that match and complement the montane birch forest and quality of light," they added. 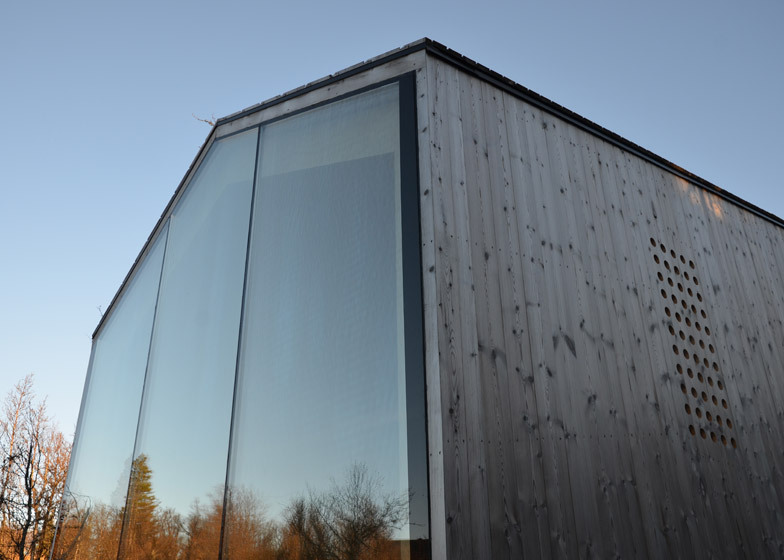 The exterior is clad in pre-patinated pine designed to integrate the building with its surroundings, while inside the spaces are lined with with untreated plywood sheets. A combined kitchen counter and fireplace with integrated log storage was cast from concrete, and this sits in the centre of the living space. 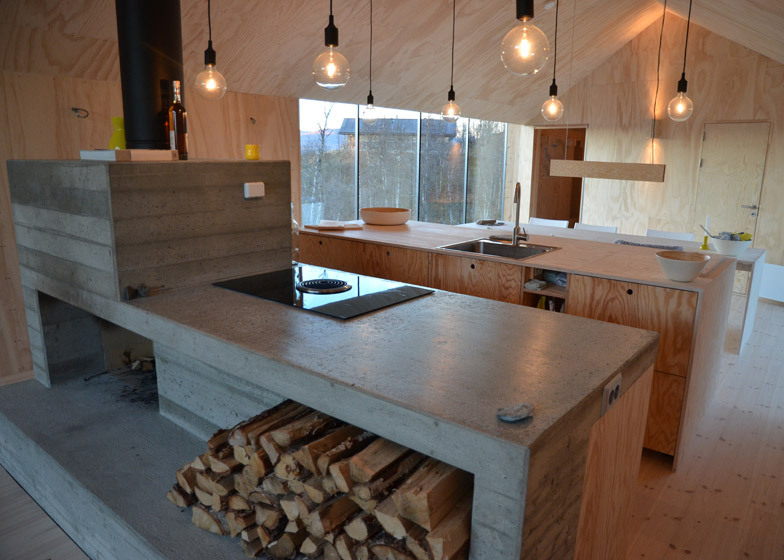 A black metal flue rises through the top of the concrete hood and into the sloping timber ceiling. 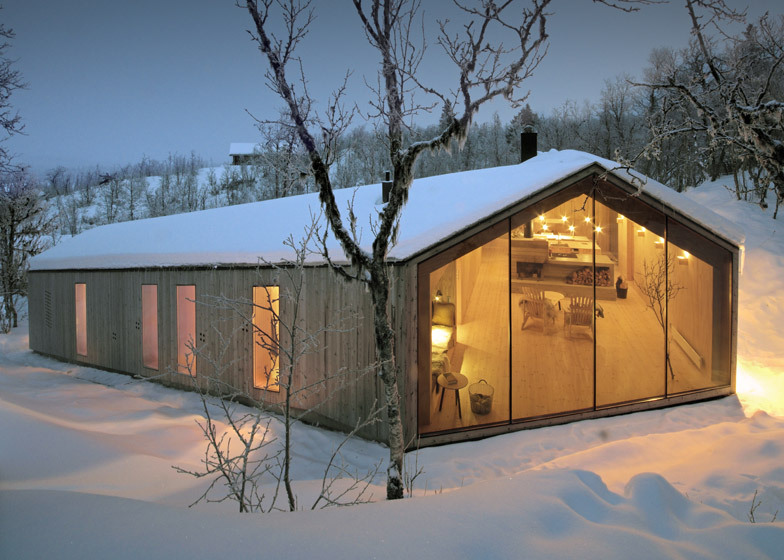 "Simplicity and restraint characterise the lodge in its form, program and materials," said the architects. 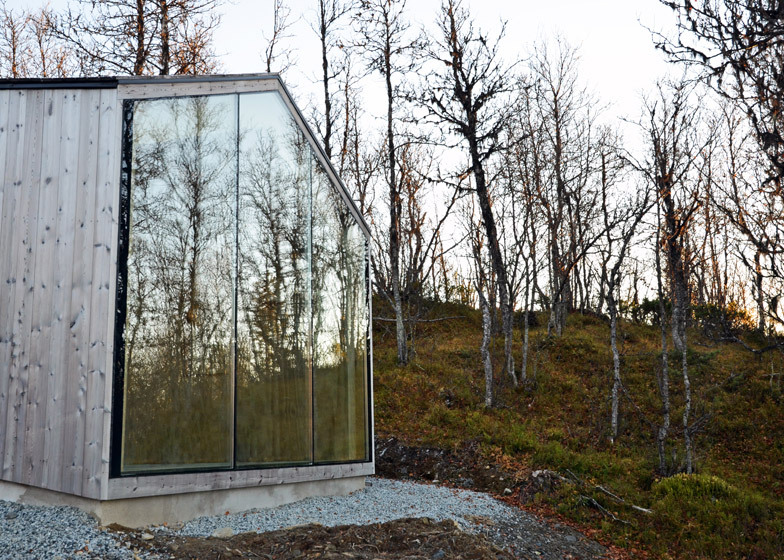 "Its form reinterprets local and national building traditions, with materials that match and complement the montane birch forest and quality of light." 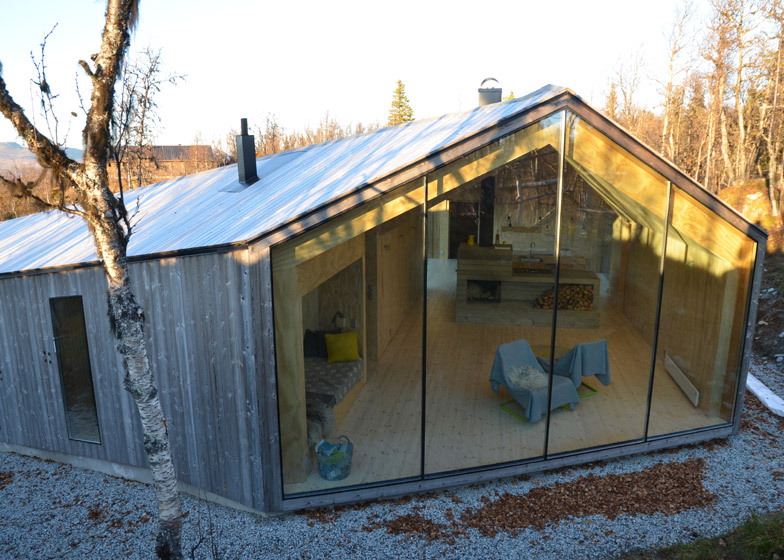 One of the glazed gable walls sits at the lounge end of the open-plan living space. A soft seating area occupies a wall recess on one side of this glazing, creating a quiet hideaway that residents use for "relaxation and contemplation". 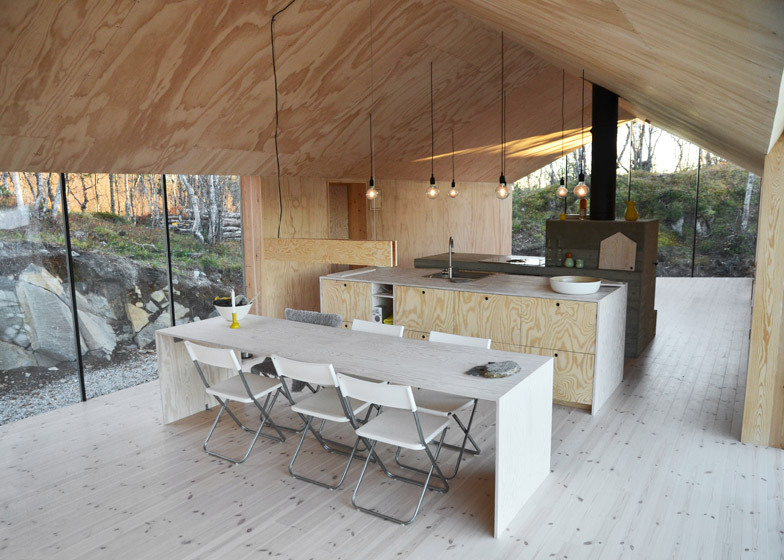 Behind the kitchen, a timber partition in the crevice of the V slices the building in half. 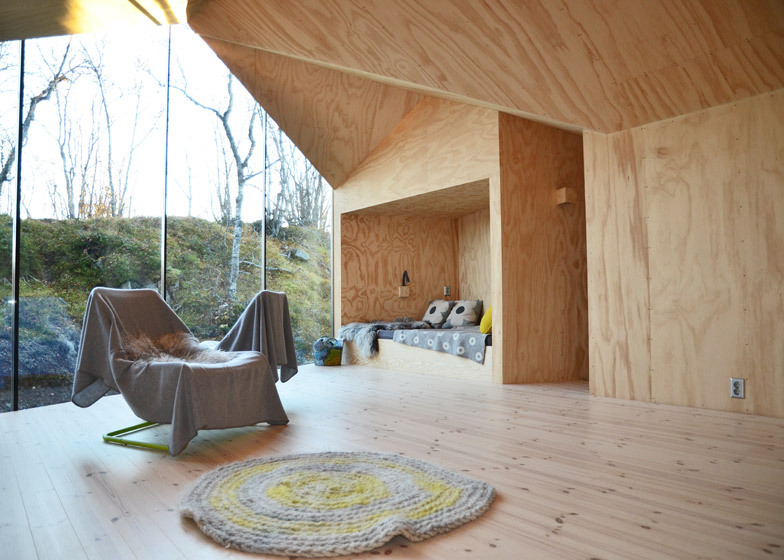 In the second volume, three bedrooms, bathrooms and a playroom are distributed across stepped levels that descend with the terrain. At the end of the corridor, the playroom sits behind the second glazed gable. 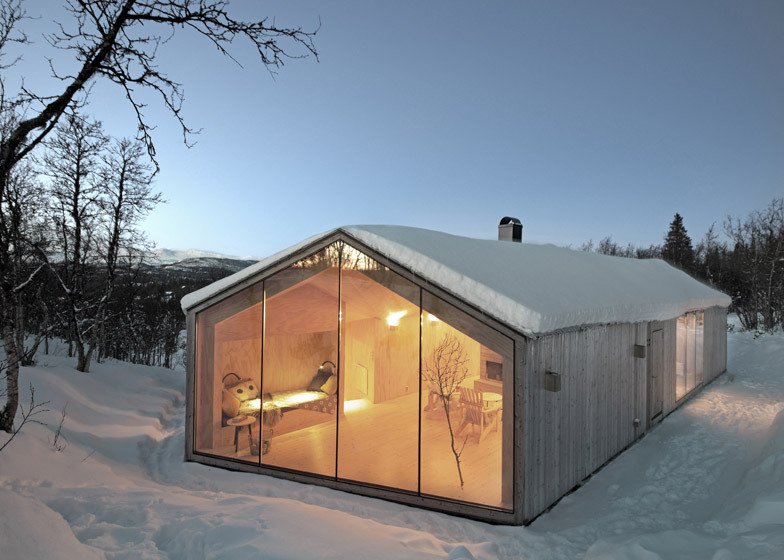 Photography by Reiulf Ramstad Arkitekter.